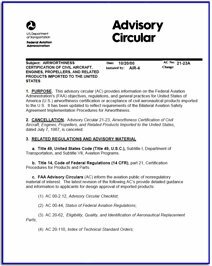 The following FAA Advisory Circulars are related to aircraft certification. As the name implies, they are advisory in nature and are published by the FAA to help persons comply with certain regulatory requirements. We have included them on our website as a matter of convenience. You can download a copy of these Advisory Circulars simply by clicking on the text and selecting a location to save the file.